“An established name in the Scandinavian progressive scene, The Divine Baze Orchestra has been working on their sound for almost eight years. Their debut “Once We Were Born” recieved good reviews all over the continent, and now the quintet announce the release of their anticipated sophomore album, entitled “Dead but Dreaming”. The lead singer and guitarist Oliver Eek describes the new album as a tribute to H.P Lovecraft, the late legendary fantasy writer. “The lyrics”, Oliver continues, “are heavily inspired by Lovecraft’s work, especially the “Cthulu”-suite, and deals with themes such as cosmic horror and forces that stand above the power of humanity.” The five members’ great musical talent is apparent, with complex arrangements that never limit themselves to genre, but at the same time accurately follows the lyrical twists and turns. 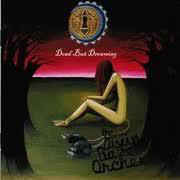 “Dead But Dreaming” sounds like no other album in the genre, and marks a big step in the development of progressive and art rock music. A must-have for fans of H.P LOVECRAFT, KING CRIMSON and URIAH HEAP. Categories: CD-Distribution, DISTRIBUTION, DISTRO STORE. Tags: Jazz Rock, Prog Rock, Transubstance Records.